Keith Hubert Barker peacefully passed away on April 11, 2015, just two months short of his 90th birthday. He was predeceased by his parents Willard and Eva (nee West) Barker, his wife Sadie (nee Pongoski) in 2007, and his infant son Brian in 1948. He leaves to mourn his daughters, Terry (Russ, deceased) Reath, Arlene (Lloyd) Harris, Trish (Brian) Reid, Colleen (Mark) Borgares, his son Warren (Maria) Barker, 16 grandchildren and 21 great-grandchildren. 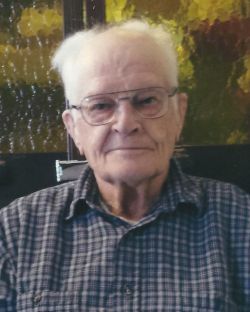 He is also mourned by his only sister Muriel Dalrymple (Roy, deceased), his brother-in-laws and sister-in-laws, Ted and Noreen Pongoski, Roger and Rose Pongoski, and Joan Pongoski (George, deceased), and several nieces and nephews. Keith was born in Weyburn, Saskatchewan on June 15, 1925, the only son of Willard and Eva. He attended school at North Weyburn for a few years, then Talmage, Saskatchewan until 1937. The family then moved to Oakville, Manitoba where he finished his Grade 12 and met Sadie. In 1944 he joined the Royal Canadian Engineers until he was discharged at the end of the war. He and Sadie were married on November 20, 1945. They worked as farm help for his father, grandfather and uncle until 1948, at which time they started farming on their own in the Elm River District south west of Oakville. They farmed there until 1990 when they retired to Carman. In Carman they became involved in their church and several community activities where they made many wonderful friends. Keith was a creative carpenter in addition to being a good farmer and he loved working with wood. He enjoyed attending craft sales with his many creations. A public memorial service for Keith will be held on Monday, April 20th, 2015 at 3:00 p.m. in the ElmCreekMennoniteBrethrenChurch, 146 Poplar Avenue, Elm Creek, Manitoba. A private family burial service will be held prior to the memorial service. The family would like to thank his friends and the CarmanMennoniteChurch for their help and kindness over the past few years, as well as those who provided care for Dad in Carman. A special thanks to the Foyer Notre Dame staff for their kindness and wonderful care of Dad in the short time he was with them. Memorial donations may be made to The Gideons International, 501 Imperial Road North, Guelph, Ontario, N1H 6T9.